Your Back-to-Basics Guide to Simplifying Life and Embracing What Matters Most. Helps women put first things first so that she can live a more confident, fulfilled life. - What do I believe? - How do I grow closer to God? - What should my character and life reflect? - How do I live my life every day? 'Essentials for Life for Women' offers fifty daily or weekly readings that each include a key life principle, scripture and quotes, meditation, and an application. Each discussion offers hope and a sense of peace and well-being by focusing on life with an eternal perspective. The content offers spiritual truth while the interior graphic design, including sidebars and visuals, enhances the readability and the impact of each core essential. 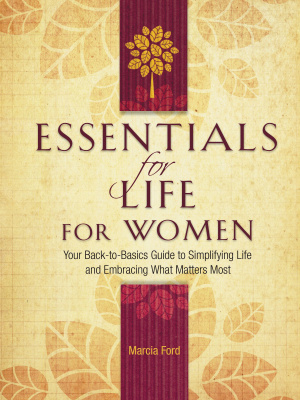 Essentials for Life for Women by Marcia Ford was published by Thomas Nelson in May 2010 and is our 16110th best seller. The ISBN for Essentials for Life for Women is 9780785229711. Be the first to review Essentials for Life for Women! Got a question? No problem! Just click here to ask us about Essentials for Life for Women.